*Carrion crows in the Japanese city of Sendai have learned to use passing traffic to crack nuts. *Lizards in Puerto Rico are evolving feet that better grip surfaces like concrete. *Europe’s urban blackbirds sing at a higher pitch than their rural cousins, to be heardover the din of traffic. Menno Schilthuizen is one of a growing number of “urban ecologists” studying how our manmade environments are accelerating and changing the evolution of the animals and plants around us. In Darwin Comes to Town, he takes us around the world for an up-close look at just how stunningly flexible and swift-moving natural selection can be. With human populations growing, we’re having an increasing impact on global ecosystems, and nowhere do these impacts overlap as much as they do in cities. The urban environment is about as extreme as it gets, and the wild animals and plants that live side-by-side with us need to adapt to a whole suite of challenging conditions: they must manage in the city’s hotter climate (the “urban heat island”); they need to be able to live either in the semidesert of the tall, rocky, and cavernous structures we call buildings or in the pocket-like oases of city parks (which pose their own dangers, including smog and free-rangingdogs and cats); traffic causes continuous noise, a mist of fine dust particles, and barriers to movement for any animal that cannot fly or burrow; food sources are mainly human-derived. And yet, as Schilthuizen shows, the wildlife sharing these spaces with us is not just surviving, but evolving ways of thriving. 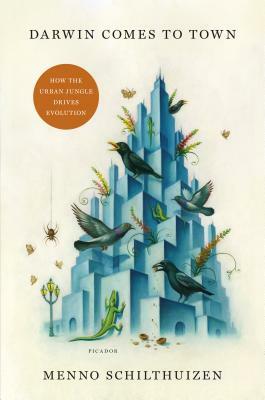 Darwin Comes toTown draws on eye-popping examples of adaptation to share a stunning vision of urban evolution in which humans and wildlife co-exist in a unique harmony. It reveals that evolution can happen far more rapidly than Darwin dreamed, while providing a glimmer of hope that our race toward over population might not take the rest of nature down with us. MENNO SCHILTHUIZEN is a senior research scientist at Naturalis Biodiversity Center in the Netherlands and professor of evolutionary biology at Leiden University. He received his PhD from Leiden University in 1994, obtained two postdoctoral fellowships at Wageningen University, and then spent seven years in Malaysian Borneo as associate professor at the Institute for Tropical Biology and Conservation. His research revolves around evolution of biodiversity in insects and land snails and he has written more than 100 high-impact papers in the scientific literature on these and other subjects. Besides his scientific work, he is a prolific science popularizer who has written more than 250 stories, columns, and articles for publications including New Scientist, Time, and Science. A frequent guest on radio and television, he is the author of Frogs, Flies and Dandelions (Oxford University Press, 2001), The Loom of Life (Springer, 2008), and Nature’s Nether Regions (Viking, 2014). Audiobooks from our partner, Libro.fm, are here! Click for more info. Browse our eBooks, now available through Hummingbird digital media!